Are you looking for an opportunity to make a real difference in our community? Then there is a place for YOU at the Kane Center! We would not be able to provide our wide array of programs and services without the generosity, kindness and talents of our volunteers. Every day, our volunteers improve the lives of elders by delivering Meals on Wheels, getting involved in Adult Day Club activities, serving food or serving as a cashier in the Bistro, fundraising, or helping out in many other ways with clerical and other expertise. Download our Volunteer Application or call us at 772-223-7800 to request an application. Return your application to the front desk at the Kane Center or mail it to the address below. We will contact you once your information is received. 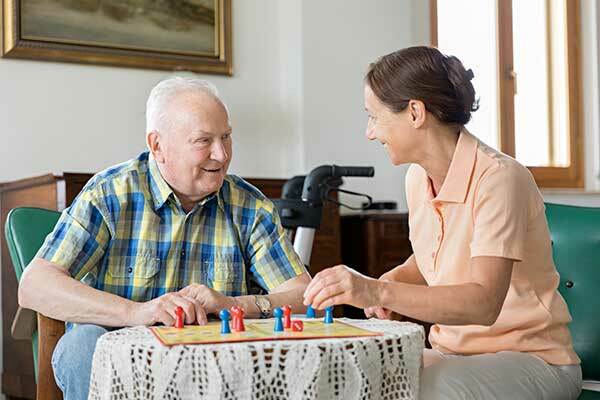 The Adult Day Club provides a safe, nurturing environment with medical supervision for seniors who benefit from Club services, exercises and other activities. Volunteers can serve food or help with activities and crafts. We also welcome musical performers or others who can entertain our Club members. Monday through Friday, our volunteers deliver hot, nutritious meals to homebound elders through our Meals on Wheels program. These volunteers can sometimes be the only friendly face a lonely senior will see during the day and are a valuable resource for making sure an older person living alone is OK.
Training takes just 30 to 45 minutes and can be scheduled at your convenience. Assigned routes are convenient to your home or businesses, or you can request a specific route. Volunteering with Meals on Wheels takes just two hours each week. You can share a route with someone, or your school, business or organization can adopt a route to share. If you can't commit to a fixed schedule, we need "on call” volunteers to fill in for regulars who might be away for a few days or weeks. Volunteers use their own vehicles to pick up the meals at distribution sites, then deliver them between 10:30 a.m. and 12:30 p.m.
A valid driver's license and an insured vehicle. A completed Meals on Wheels volunteer application. Two clean coolers to transport the meals. You will complete training prior to making your first delivery. We can arrange for you to team up at first to become acquainted with your Meals on Wheels clients. Volunteers are routinely needed in the Council on Aging office to answer phones, file and help with fundraising and newsletter mailings. With over 6,500 newsletters distributed regularly, this is no small task! Our gang of "Super Stuffers” is on call to help the Development Department assemble mass mailings and prepare them for distribution by the Post Office. But it’s not all hard work. On mailing days, our volunteer crew members enjoy coffee, doughnuts and socializing. Their good deeds are also good fun! As with any non-profit organization, the Council on Aging relies on the generosity of private donors to help us fulfill our mission of providing professional and compassionate care to seniors in Martin County. To help raise money and awareness for the Council, we hold a variety of special events throughout the year, such as a fashion show and our annual Sage Awards. Our fund raising volunteers act as support staff in organizing these events. They work closely with our Development Department to ensure that vital programs such as Meals on Wheels, adult day care and more are available to the seniors who need them. It’s a fun and fulfilling way to volunteer! The Kane Center Bistro offers a tasty array of snacks, beverages and lunch selections. We rely entirely on volunteers to staff the Bistro. Duties include running the cash register, helping customers select their refreshments, and serving items such as soup and crock pot meals. To learn more about how you can volunteer with the Council on Aging of Martin County, call our Volunteer Coordinator, Curletha Campbell, at 772-223-7829 or by email at [email protected]. Help us make the Kane Center a welcoming place for all. Greet and direct visitors. Sell tickets to upcoming shows and events. Provide visitors general information about our programs and services and conduct Kane Center tours. In the event of a hurricane, the Kane Center will open as a hurricane shelter. Our Natural Disaster Heroes help us set up and breakdown the shelter. We also need Heroes (particularly those with medical experience) to help us care for our clients during the storm. Download our Volunteer Application today and submit it to the VOLUNTEER COORDINATOR to see how you can start HELPING ELDERS in your community.